The Health Assisting Program offers students the education to gain access to a versatile, in-demand health care career. The program is designed as a "cluster" program where students are introduced to the knowledge and skills needed for an entry-level career in the health care field. This course also gives students who are interested in continuing their education after high school in any health care-related field a solid base of knowledge that will give them a step ahead in their post-secondary studies. 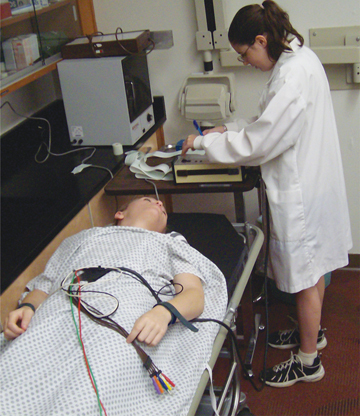 Instruction in the Health Assisting program provides a background in many subjects, including basic anatomy, physiology, diagnostic studies, pathophysiology, medical terminology, clerical skills, and hands-on practical skills. Students develop their skills by volunteering at Pennknoll Village. We also do our best to partner with UPMC Bedford Memorial for a job shadowing experience at the hospital. These unique opportunities provide the students with experience in patient interaction and the ability to acquire real-world knowledge within a medical facility. Students will complete a state-approved Nurse Aide Training program during their senior year of the program taught by a separate instructor during their regularly scheduled class times. Through this program, they will also complete clinical rotations at a local long-term care facility. Also during their senior year, students have the opportunity to take a 3-credit Medical Terminology college course through Allegany College of Maryland as part of this program. National Occupational Competency Testing (NOCTI) to earn Advanced Certification is administered upon completion of this course. Finally, students will complete CPR and First Aid training and become certified during their time in the program. Nursing Assistant, Medical Office/Dental Office Assistant, and other entry level positions such as Dietary Aide and Unit Clerk/Receptionist are examples of careers that may be obtained after completing the Health Assistant Program. This course also prepared students for advanced studies in the health professions such as Licensed Practical or Registered Nurse, Medical Assisting, Radiologic or Surgical Technology, and Physical or Occupational Therapy. Students pursuing these career paths need to complete programs after high school to work in these fields, but the Health Assisting program helps give them a sound base of knowledge to help them succeed in such programs. A few examples of post-secondary institutions are Allegany College of Maryland, South Hills School of Business & Technology, and Penn State University.